In January of 2013, my brother Devin and I partnered with Embrace Kids Foundation to launch a campaign against sickle cell disease. 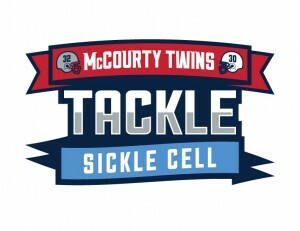 The campaign, entitled “Tackle Sickle Cell” aims to educate the public, increase blood donors and raise money & awareness for the fight against sickle cell disease. On Sunday, May 19th, we are hosting a 5K Run/Walk in Liberty State Park in Jersey City, NJ as the major fundraising component of the TSC Campaign. The Run/Walk is for all ages and will be followed by a celebration including music, food, and fun at the park. Devin and I will be joined on this day by fellow members of the NFL & Rutgers football community.